“Paddington wouldn’t hesitate if any of us needed help! We have an annual tradition. The last day of the year we go to the cinema with the whole family to end that year with a cozy family film. This year the kids had their minds set on an adventure of the adorable and over-friendly British bear Paddington. To be honest, I was reluctant to watch this movie and I intended to use the full duration of this film to make up for my sleep shortage caused by the Christmas holiday. But I have to admit that I actually enjoyed Paddington’s adventure. Better yet, there were even times when I laughed out loud. And believe me, that isn’t something I do often during a film. No nagging for popcorn. That means the movie was entertaining enough. A good indication wether the film was a success or not, are my two children. Full of excitement they were watching the film without fidgeting in their chairs and without nagging for another snack constantly. I hadn’t seen Paddington’s first film, unlike my two little brats. I can only remember the hilarious bathroom scene where a terrible amount of water was used. I was hoping this film would be packed with such crazy situations and that it wouldn’t be a corny, honeyed tearjerker. And you can rest assured. There are plenty of those crazy situations. From the beginning it became clear that we would see a series of visual jokes Buster Keaton would be jealous about. 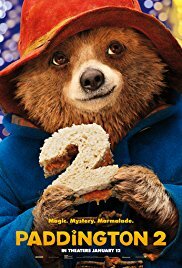 From two adult bears rescueing young Paddington in the Amazon forest to the mess Paddington caused during the execution of his jobs. Jobs that he has to carry out so he can buy a huge picture book for his aunt’s birthday. A picture book that has hints so you could find a treasure (something Paddington doesn’t know of course). Grant and Gleeson. Top-notch acting. In terms of acting, it’s mainly that of Hugh Grant and Brendan Gleeson I liked the most. Hugh Grant as the narcissistic-minded Phoenix Buchanan whose house is full of self-portraits. Perhaps the subtle humor won’t be noticed by the younger viewers, but the way the actor Buchanan demonstrates the exaggerated portion of self-mockery, can be called truly brilliant. Obviously, the way he tries to discover the clues in several London landmarks is rather exaggerated. But the entertainment value is of a very high level. It ‘s also a joy to watch Brendan Gleeson as Knuckles McGinty. He’s the frightening cook in the kitchen of the prison where Paddington ended up. And he runs that kitchen like a real tyrant. The fact that Paddington’s fellow prisoners look rather pink in their prison outfit because of Paddington’s clumsy behavior and then they demonstrate their pastry skills, isn’t top-class humor either. But again, the entertainment value is shockingly high. My son watches a movie using his heart. I’m watching it using my brain. All in all, this is a successful family film every person of any age can enjoy. And the release date is also chosen strategically. After all, it’s the Christmas period. However, I don’t think it will match the success of “Home Alone”. I’m sure we’ll still see the latter on a multitude of television channels every year. Unfortunately, because I like a bit of variety. I had a double feeling about the ending. At first I thought it was an artificial trick to get the audience into a sentimental mood. But then it took a completely different turn when I heard the reaction of my youngest son, who, after his mother told him how it would end, replied surprised : “How did you know that, mum ?”. At that moment I think jealousy came into play. I realized that I had lost the wondering and amazement that a child experiences. I am rarely surprised by a film. Most of the times I can predict the ending of a film in advance and I realize afterwards that I’m analyzing the film instead of enjoying it. And that little boy is overwhelmed by that self-evident ending. A film with lovely Paddington made me realize this. A film is a weird medium.